You’re thinking, yes, yes, you’ve talked about this before. But I have short-term mom brain so really all I can fixate on is this pregnancy and how I’m surviving. And considering that my midwife & I agree to not go 42 weeks (like last time–10 pounder), that means I will only be pregnant for 7-8 more weeks. WE CAN DO THIS. Yes, the throwing up continues as does varicose crippling pain, as does all the unmentionables (are there any left?) of pregnancy, but I’m so damn grateful for this baby girl that I just am coasting through the finish line. My sister gave me one with my second? third? pregnancy for nursing, but it’s also the only thing I can sleep with that comfortably supports my belly and my back and helps prop me up with insane heartburn that’s like a firehose. They’re cracked all the time from breathing in & out of my mouth. And frankly, they retain chocolate from my afternoon mint chocolate ice cream, which is an inexcusable tell-tale sign of raiding the freezer. So here it is: my sister’s amazing organic balm collection! My house is old and cold already. And I live in a version of theses for my toesies. Like, all the time. They make my swollen feet feel better. Straight up sea salt from the Dead Sea. I feel so much better after a bath this pregnancy. It’s the only thing that gives me reprieve from the watermelon belly. I grab a few bags of this at a time and then douse my bath in them. Water makes me vomit. And increases my heartburn. So I pace myself throughout the day and take little sips hours away from food and it kinda keeps me hydrated! This is my fav water bottle, but I’m sure there are lots of good ones out there. I like it because it goes in the dishwasher easily and rinses easily and the cap never fails me. NO SPILLING. I probably eat 2-3 a day. They taste like a fresh breath of air. I love them so much. Minnesota farmers at the University helped create this man-made wonder. And I’m so so grateful. If you think all apples taste mushy and bleh, get thee to the honey crisp section. And yes, you can buy them online. Which is amazing. 7) Madame Secretary & Poldark & 30Rock. I watched all of 30 Rock during the beginning of pregnancy. All seven seasons. And Madame Secretary is my absolute favorite show. Poldark is . . . well anxiety inducing for one, but also gripping. Streaming on amazon prime! Netflix has 30Rock, and you can watch M. Sec on the CBS website for free the day after. Other shows have been fine here & there, but these three are ones I’ll remember most for this pregnancy. Making prayers immediate and right at my finger tips. I have an old metal one, but am eyeballing this beautiful olive wood one. For non-Catholic pregnant mamas, maybe a calming bead bracelet or necklace. Something to keep mindfulness at our fingertips while just living (surviving?) minute to hour! Yes, it increases heartburn. But to hell with it! I cannot live without my ice cream. Talenti is one of my favs. And can be ordered in an EIGHT pack via amazon. But our local creamery is amazing, too, and their peppermint bonbon is a go-to. Or rather, a send-to. As in, send my husband to there. Okay, dish. 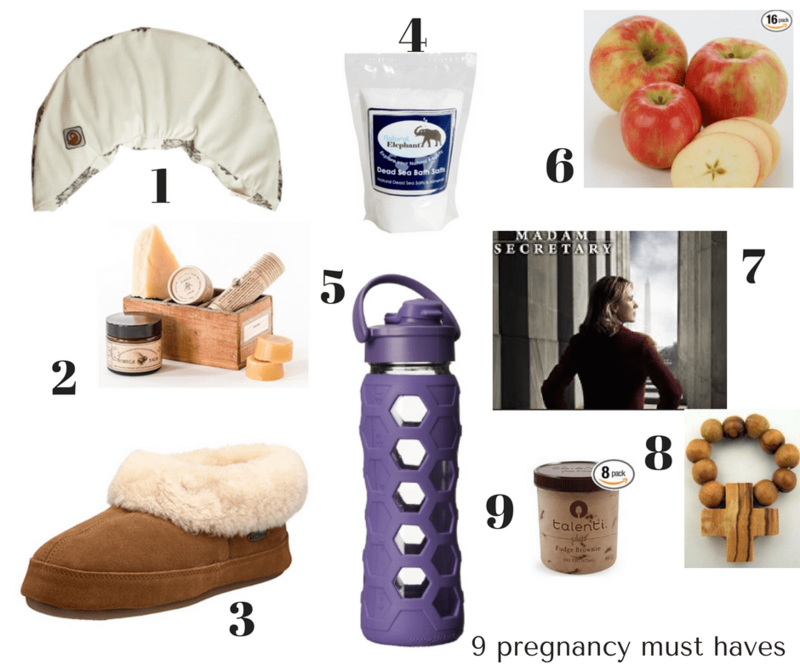 What’s on your must-have pregnancy list?? Wait wait wait wait WAIT. You can order 8 packs of Talenti from Amazon?! I’m ashamed I didn’t know this. I’m about a week ahead of you, looking towards that finish line (which unfortunately includes a 6th c-section, but fortunately should be happening around 37-38wks). My must haves are the Snoogle maternity pillow with velvet cover, and bags of soft ice from Sonic (which I eat with a spoon out of a Tervis cup all day). Also great this time around…a 13yr old daughter who can help out and babysit! Soft ice. So so smart!! I am not pregnant, as of today, but nice list. My baby got sick last week and I started Poldark. It was nice to give myself the slack and watch episode after episode totally guilt-free. I just finished “Indian Summers” before starting Poldark. It was pretty good, but kids need to be asleep and stay close to the fast forward. Hang in there and prayers! I watched an episode of Outlander and was like “uh fast forward fast forward” so I hear you on that! Thank you so much for the encouragement and prayers! I’m nearly 36 weeks and have a similar list, just switch out honey crisp for a sweet tango (often with a side of sunbutter) and Epsom salts for sea salt. Almost there!! Huh. One of my friends said ice cream helps her pregnancy heartburn, so I’m going to go with that. I love lists. All lists. This is a good one! Prayers for you and baby! We pray for expectant families in our nightly family prayers. well I’ll take that as science! This is a great list. Mmm…ice cream. 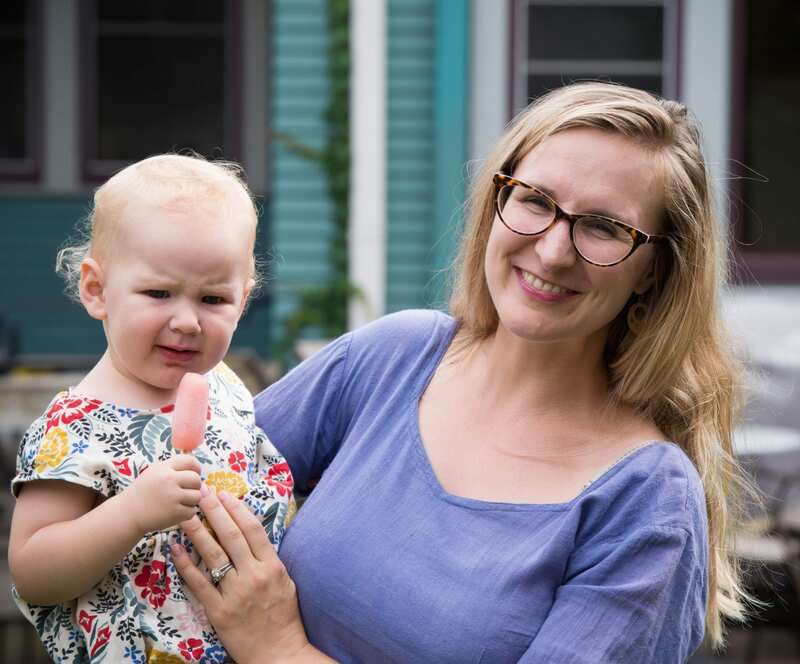 Any ice cream tasted amazing when I was pregnant, although I’d add bananas and peanuts and whatever else I could on top to up the protein count (thanks to those food charts we had to turn into our Bradley teachers!). When I was pregnant in the not-so-distant past, one of my big necessities was popcorn. It was light, delicious, and I read somewhere that it’s supposedly good for pregnancy, so that was nice :) Another big thing that got me through the nauseous parts of pregnancy was youtube literary adaptations, specifically The Lizzie Bennet Diaries and Emma Approved. OOO I’m going to make popcorn tonight! Cheesy popcorn sounds really good right now!! So sorry it’s so bad. Building babies is HARD man. Madame Secretary, amahzing, and I need those slippers.